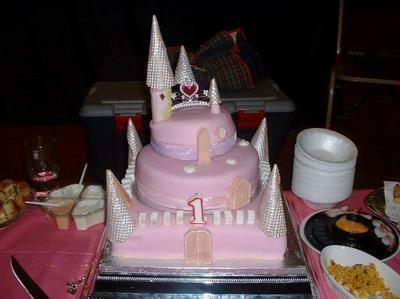 This pink princess castle cake is a cake that I made for a first birthday cake. The cake is a red velvet sponge cake covered in pink sugar paste. The cake used for the base was a 12 inch square cake. The one used for the middle was a 10 inch round cake. The cake that was used for the top tier was an 8 inch round cake. The towers are simply made out of mini chocolate roles which I trimmed into the right size and covered in sugar paste. For the peaks, I painted ice cream cones and placed them on the cake as shown. The windows are made out of pink biscuits that I cut to size and glued onto the cake. For the finishing touches, I piped some green vines on the tallest tower and glued sugar cubes around the outside of the cake as shown in the picture above.